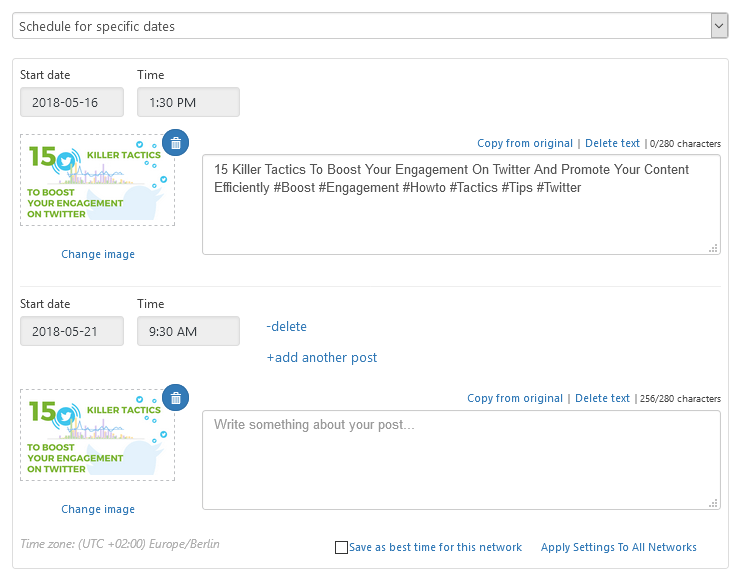 With Blog2Social 4.8, planning and scheduling multiple individually tailored posts is getting even easier. Create unique social media posts by using individual comment texts, hashtags, @-handles and images (with the photo-post format) for your posts with only a few clicks. 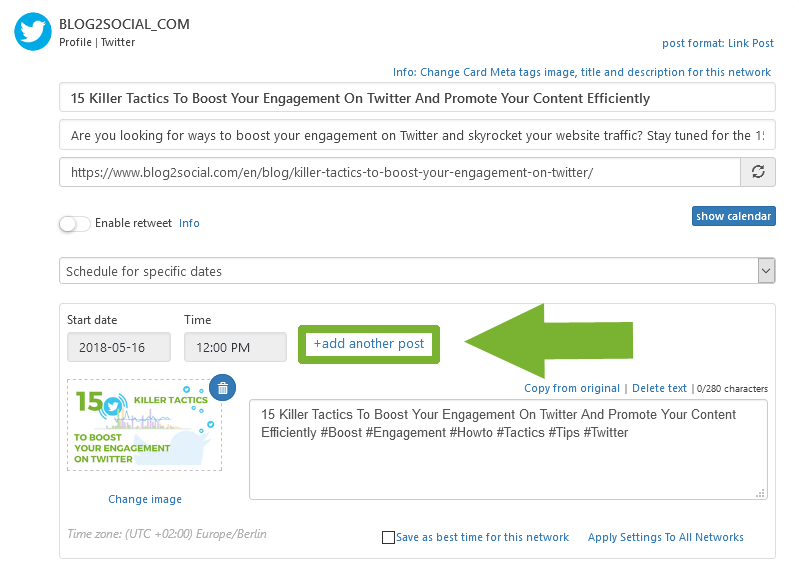 You can plan multiple individually tailored posts for Twitter, Facebook, VK, Google+, XING, LinkedIn, Instagram, Pinterest, Flickr, Diigo and Reddit. 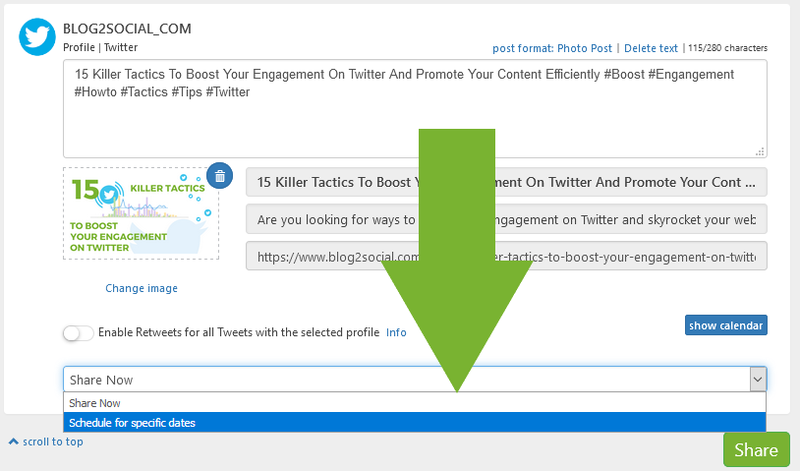 or open your blog post editor and click “Customize & Schedule Social Media Posts”. Select the social media networks you want to share your blog post on and customize your first post. Then select “Schedule for specific dates”. To add a second post, click on “+ add another post”. You can now customize another post. To select different images for each post, make sure that the post format is set to “Photo Post”. If you select “Link Post” format, the selected image will be the same for every post, since the networks will display only image data that are defined in your Facebook Open Graph and Twitter Card parameters. Schedule uniquely tailored posts for different dates and times to maximize engagement. Posting multiple images from your blog post to Instagram, Pinterest & Flickr is now easier and quicker than ever! Just select a different image for each of your posts and click share. >> You want to retweet some of your Tweets to different Twitter accounts? Learn how to do it with Blog2Social! How can I monitor the reach of my Facebook posts? How to automatically add Hashtags to Social Media Posts? How do I insert individual hashtags in my posts? Can I save a specific selection of networks? How do I add emojis to my social media posts? Can I remove the "Posted by Blog2Social" stamp from my Facebook posts? 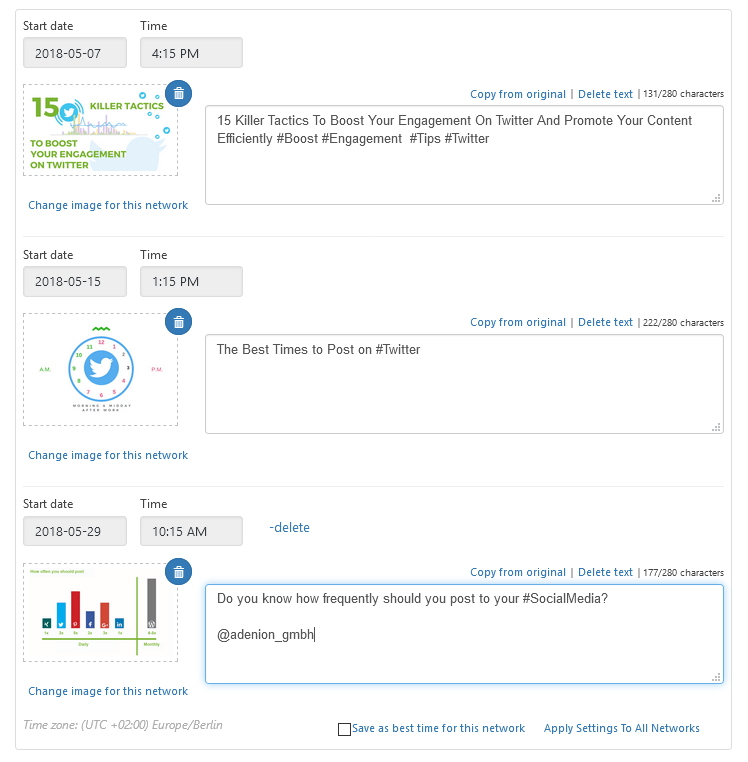 How do I delete the text automatically generated by Blog2Social? Where do I see how many characters I have left for my post? What is Facebook Instant Caching? Why doesn't Pinterest post my image or displays my image incorrectly?